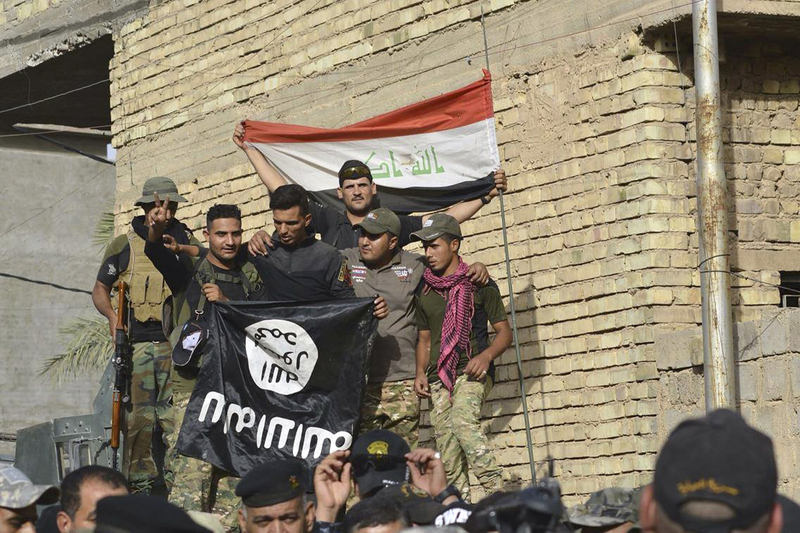 BAGHDAD -- Iraqi forces battled Islamic State of Iraq and Syria (ISIS) militants in pockets of Fallujah on Monday, days after the government declared the city's liberation. Iraqi special forces say they are closing in on the remaining ISIS strongholds but that their progress has been slowed by snipers hiding in residential buildings. Brig. Gen. Haider al-Obeidi, of the special forces, told The Associated Press he hopes to clear ISIS out of Fallujah completely "in the coming few days." ISIS militants still control the northern Golan neighborhood as well as other scattered pockets, where they are largely surrounded. Al-Obeidi says Iraqi fighters who know the terrain and can blend in with local residents have largely melted away, leaving behind foreign fighters who have little choice but to fight to the death. "The Iraqis, they know how to escape, but for the foreigners, they can only surrender or die," al-Obeidi said. Prime Minister Haider al-Abadi declared victory in Fallujah on Friday after special forces entered the city center, capturing government buildings and the central hospital following weeks of fighting. Iraqi commanders said 80 percent of the city was under their control, though clashes were still underway. Fallujah, which is less than an hour's drive from Baghdad, was the first Iraqi city to fall to ISIS, in January 2014. At the height of the group's power it controlled a third of Iraq, but now the government says it only holds 14 percent of the country's territory. That includes Mosul, Iraq's second largest city, which fell to ISIS in the summer of 2014. Iraqi forces in Fallujah were aided by the U.S.-led coalition, which launched 17 airstrikes in and around the city over the past week. The Pentagon says those strikes destroyed dozens of ISIS fighting positions, weapons and vehicles. The operation inside the city was carried out by the Iraqi army, regional and federal police, and special anti-terrorism units. Shiite militias, known as the Popular Mobilization Force, remained outside Fallujah and have not taken part in the recent battles. More than 14,000 families have fled Fallujah and surrounding areas since the operation to retake the city began in late May, including nearly 10,000 families in just the last four days, according to the United Nations. The exodus has overwhelmed camps for the displaced run by the government and aid groups. The U.N. has released $15 million in emergency aid to provide life-saving assistance to those who have fled the recent fighting in Fallujah. U.N. humanitarian chief Stephen O'Brien said "people escaping Fallujah are in desperate need of assistance" and need urgent help "before this situation becomes a humanitarian catastrophe." The conflict with ISIS, which also controls large parts of neighboring Syria, has forced more than 3.4 million Iraqis to flee their homes. More than 40 percent of the displaced are from Anbar province, according to the U.N.